XINING: The population of endangered black-necked cranes has been growing steadily at the headwater of the Yangtze River, China's longest river, over the past few years. In the past two years, researchers have monitored the number of the rare cranes in a 110-hectare area in the Jiatang Grassland and the Longbao nature reserve in northwest China's Qinghai Province. Data showed that more than 180 black-necked cranes live in this area. 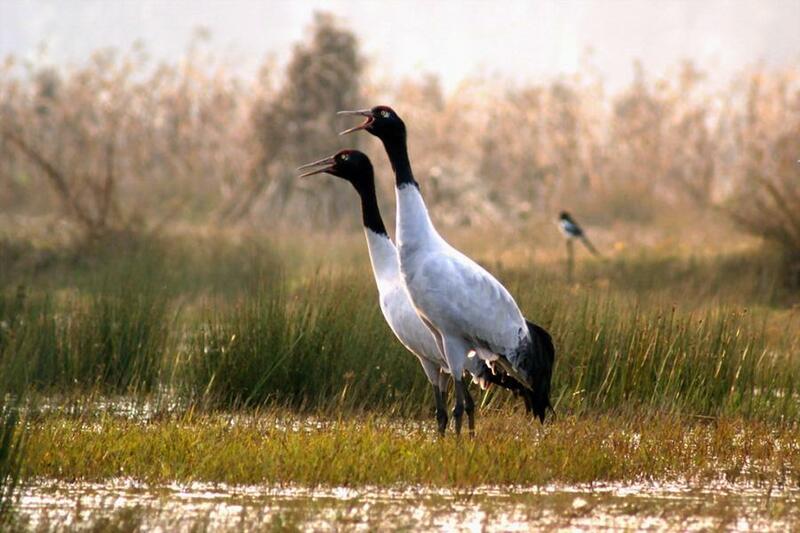 Another 312 black-necked cranes were spotted on the banks of a river in the Jiatang Grassland in early April, posting a record high, said Han Xuesong, a researcher with Shanshui Conservation Center, who has been conducting research at the Yangtze's riverhead for years. He added that the population of black-necked cranes has been increasing, and their habitats have been expanding as the environment at the Yangtze's headwater has improved. According to a white paper released by China's State Council Information Office in July, a number of eco-projects have been implemented on the Qinghai-Tibet Plateau, achieving positive results in ecosystem conservation. Black-necked cranes inhabit meadows, wetlands and lakes at an altitude from 2,500 to 5,000 meters. They mainly live in highlands in China, India, Bhutan and Nepal. With an estimated population of around 10,200, the species is classified as vulnerable by the International Union for Conservation of Nature (IUCN) and under the top national protection in China.